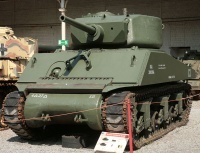 The M4A3E2 Sherman Jumbo is an American tier 6 medium tank. 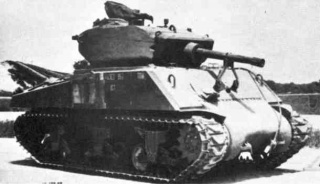 Sloped and thicker armor gives this tank a chance to bounce more shells compared to other Shermans, but the Jumbo is slower and less maneuverable. 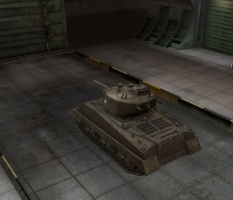 It has armor rivaling the heaviest tanks around its tier, and even tanks above it like the T29 and Tiger tanks. in addition, it is also smaller than comparable heavy tanks, making it harder for artillery to hit you. It possesses a medium's firepower and health pool, combined with a heavy's armor and speed. As a result, you will be forced to try and play smart - keep flashing your frontal armor and gun mantlet, and fire your gun at weak spots in the enemy armor. Due to its thick armor and lack of maneuverability, the Jumbo tends to be more successful as a brawler than as a typical flanking medium tank. Overall, the Jumbo is both very comfortable for beginners and very rewarding for veterans. 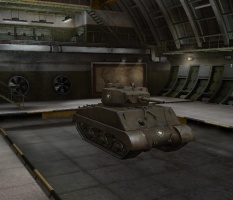 The M4A3E2 Sherman Jumbo leads to the T20, and the T29. - Heavily armored stock turret front with large mantlet and great frontal hull armor, But cannot mount 76mm M1A2. 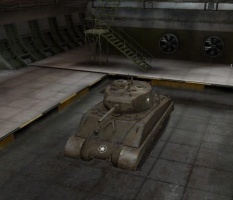 The main advantage of the Jumbo is its strong front armor, especially its turret. This is especially true in city-fighting when it is angled around corners, hiding its weaker side armor. Being virtually impenetrable(except for weakspots) from tier 5 guns, the M4A3E2 is a very dangerous opponent for many. 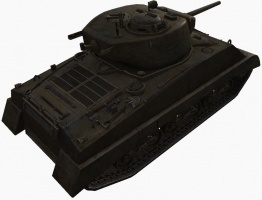 For this reason the M4A3E2 can spearhead charges and come out with little injury whenever it is on top of the list. Against higher tier opponents, it will find its armor more of a liability. More so, its gun proves to be very weak unless hitting weakspots . When facing a tougher target, flanking should often be the only option, but its slow speed is not conducive to flanking anything unless you catch them by surprise. As a result, you should shift into a supporting role when facing higher tiers. If alone and facing tanks with poor depression, it is a good idea to facehug them. With the stock turret's 152mm thick armor and extremely thick mantlet, it is almost impossible to penetrate. Be careful if you use the 105mm however, as the HE damage can damage your gun or even lower your HP. In such cases it is advisable to wait until the enemy has fired, then back away, fire and hug again. Another potential tactic is side-scraping. Although the lower section of the side is only 38mm, the upper section is 76, and still can bounce any gun in game if angled correctly.If caught in the open, don't be afraid to show a bit of your side at an extreme angle. This tactic will increase both your frontal armor and side armor, causing tanks such as the Cromwell, T-34/85, and VK series to have trouble penning you. Players who have experience with German tanks like the E-75 and E-50 will be very comfortable with this tactic. With generally better armor and roughly the same speed and manoeuvrability as the M6, this tank plays better as a heavy than as a medium. The only advantage the M6 has is its 90 mm gun. So, focus on targets you can penetrate and use your superior rate of fire to whittle them down. One of more interesting aspects of the Jumbo are that it is one of the very few tanks in the game with a real choice between which turret to use. 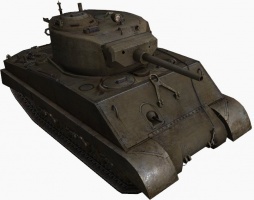 The 2nd turret is needed to use the improved M1A2 gun, offers more HP, and has superior view range and traverse. The 1st turret has very strong armour all around, but will leave you with the exact same guns the tier 5 M4 had (though with better RoF). 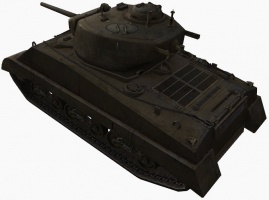 It is up to player preference whether to play the tank as a pseudo-heavy using the 1st turret and 105mm howitzer, or as a heavy medium using the 2nd turret and M1A2 gun. The Jumbo also has a 139mm thick lower glacis plate that is somewhat similar to the one found on the M36 Jackson but far thicker. This unusual feature makes the Jumbo a tough nut to crack, even when it's cresting a hill. When you get tracked while cresting, you can still bounce some shots but artillery will soon fire on you. Therefore, use this feature defensively and play smart. The Wright Continental R-975C4 engine, radio, 76mm M1A1 and 105 all carry over from the M4. You need to upgrade the suspension first, as the tank starts fairly close to its initial weight limit. From there you either get the engine next if you intended to keep the stock turret, or you can get the 2nd turret and M1A2. 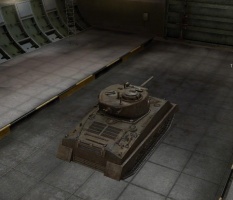 Interestingly, if you are certain you do not want to use the 2nd turret you can skip the M1A2 and research the T29. Doing so will unlock the M1A2 for free. You can also get the top engine for free upon researching the T20, but skipping that is not advised as the jumbo really wants that extra engine power. 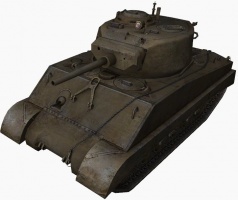 Players who wish to progress from the Sherman Jumbo to the T29, instead of going through the T1 and M6 should keep in mind that they will not have access to the 90 mm gun. This makes the T29 effectively unplayable. This can be fixed by first unlocking the T20 and using it to grind the 90 mm gun. 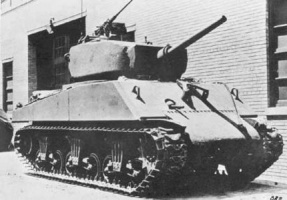 M4A3E2 Sherman Jumbo: Some units replaced the original 75 mm gun with a 76 mm gun. 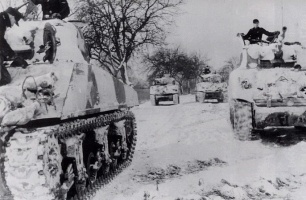 During the war, U.S. crews found that on soft ground such as mud or snow, the narrow tracks gave poor ground pressure compared to wide-tracked second-generation German tanks such as the Panther. Soviet experiences were similar and tracks were modified to give better grip in the snow. The U.S. Army issued extended end connectors or "duckbills" to add width to the standard tracks as a stopgap solution. 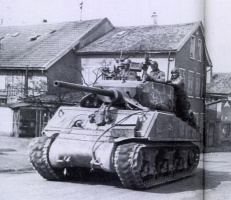 Duckbills were original factory equipment for the heavy M4A3E2 Jumbo to compensate for the extra weight of armor. Additional information can be found in an article at the Military Factory web site, which does not permit reproduction. This page was last modified on 28 March 2018, at 17:54. This page has been accessed 403,394 times.